(1 Customer Reviews) | Write Review 6 issues per year Skeptical Inquirer is the official journal of the Committee for Skeptical Inquiry. On a bimonthly basis, Skeptical Inquirer publishes critical scientific evaluations of paranormal and fringe-science claims and informed discussion of all relevant issues. "Skeptical Inquirer is an unusual hybrid, part semi-popular magazine, part scientific journal. It's fair to say that we not only help to cross disciplinary barriers within scientific fields but bridge the gaps between the hard and soft sciences and between science and the general public." 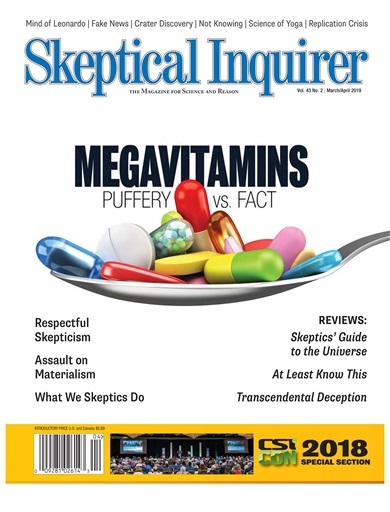 Skeptical Inquirer has been called a "spokesman for rationality," serious but highly readable," "witty and informative," and a "steady buoy in the tumultuous sea of irrationality." Its contributors have included Isaac Asimov, Martin Gardner, Carl Sagan, Stephen Jay Gould, Richard Dawkins, and hundreds of other scholars and investigators worldwide. Skeptical Inquirer is the official journal of the Committee for Skeptical Inquiry. On a bimonthly basis, Skeptical Inquirer publishes critical scientific evaluations of paranormal and fringe-science claims and informed discussion of all relevant issues. In addition to in-depth feature articles, special reports, up to date news and comment, book reviews and investigations on a wide variety of topics, Skeptical Inquirer has a stellar stable of regular columnists including Joe Nickell (“Investigative Files”), Massimo Polidoro (“Notes on a Strange World”), Massimo Pigluicci (“Thinking About Science”), Robert Sheaffer (“Psychic Vibrations”), and SI managing editor Benjamin Radford's reader-driven (“The Skeptical Inquiree”). You'll receive 6 issues during a 1 year Skeptical Inquirer magazine subscription. 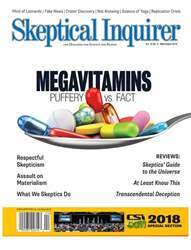 Below is a selection of articles in Skeptical Inquirer March/April 2019. You'll receive 6 issues during a 1 year Skeptical Inquirer magazine print subscription.